Hiking groups exist throughout Montana and sport a variety of distinctions. 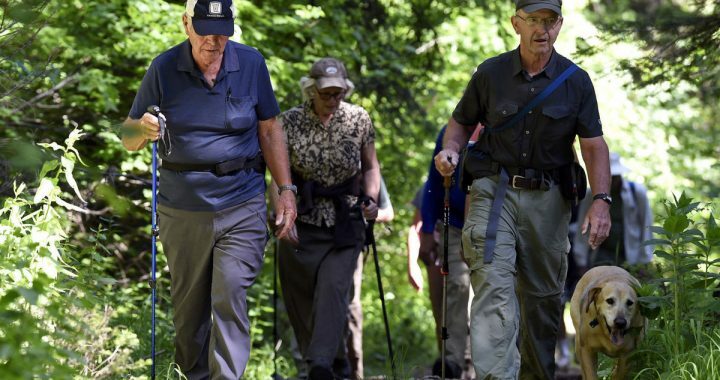 The Hospital Hikers sprouted out of Mineral County Hospital’s community health awareness program as a way to encourage people to exercise.From novice to expert, the Mineral County Hospital Hikers are a group for every age. Short hikes (2-4 miles Round Trip) to long hikes (15+ miles RT) with very little elevation climb to 2,500′ are both available. There are over 50 lakes the hikers can choose from within the area. Commercial transportation can be provided for a very reasonable fare, or, car pooling can be done. The addition of a shuttle bus to the bi-weekly hiking program proved a huge hit for folks far beyond the Superior area. Participants from Missoula, Hamilton and Thompson Falls joined in, encouraged by the camaraderie and convenience of a lift to the trailhead and back. The U.S. Forest Service’s Superior Ranger District also stepped up with advice about trail accessibility and recommendations of local experts in geology and botany to invite along.The Montana Wilderness Society and the Great Burn Study Group contributed ideas and helped publicize the schedules. The next hike will be August 4 – August 6 to Straight Creek with The Great Burn Study Group. The Great Burn Study Group is a non-profit conservation organization, that works to protect wildlands in the northern Bitterroot Mountains in western Montana and northern Idaho through advocacy and on-the-ground stewardship. View the Missoulian Article here! or visit the Mineral Community Hospital’s website for upcoming hikes! Posted in Active Living, Mineral, Programs and tagged Active, Community, Healthy Living, hiking, rural health.